Hello everyone. I know you don’t usually hear from me unless it’s a guest piece, book review or I set you some writing exercises, but tonight I have something a little different. Being Black Friday, you’re probably busy grabbing all those last-minute (or in Amazon’s case last-second) bargains and here’s another one for you… a freebie actually. 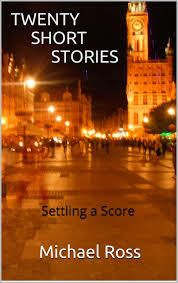 Author Michael Ross has made his short story collection Twenty Short Stories – Settling a Score free for the next three days (today, tomorrow, Sunday), and as he says, “A good way not to spend money on Black Friday”. You can download it from http://www.amazon.com/dp/B00G4E5038 or for those of us in the UK (yep, I have it and will be reviewing it in February) from http://www.amazon.co.uk/dp/B00G4E5038. I am in my final year of a part time 6-year course at Bristol University. For my final dissertation (The BIG one), I have penciled in the following for my essay. “The short story – why is it not longer?” Do you think you and @your@ people would like to offer a suggestion or two? Of course you would because you’re so lovely. So to do so, and feel the warm glow of helping a fellow writer for the time it takes to drink a cup of tea (unless you’re like me and have little milk so it takes a while… and my other half would say I cut a short story long! )… please contact Michael with your suggestion (or three – he asked for two but I did say you were lovely) via email (preferred) or you can leave a comment below and I’ll pass it on. Thank you. Free eBook! Still available for Kindle on Amazon.com.